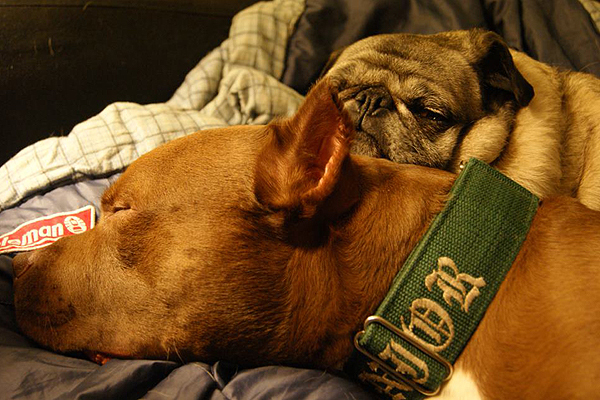 It’s easy to assume we know the story behind most shelter pit bulls, but do we? Anyone who has spent time in a shelter knows the scene in the lobby: a seemingly endless flow of people surrendering their pets. Anyone who has spent time advocating for pit bulls knows the story: Irresponsible or uncaring people get “these dogs” and dump them at shelters when they’re no longer wanted. But do we really know each dog’s story? Do we really know “those people” surrendering “those dogs”? But is that always the case? 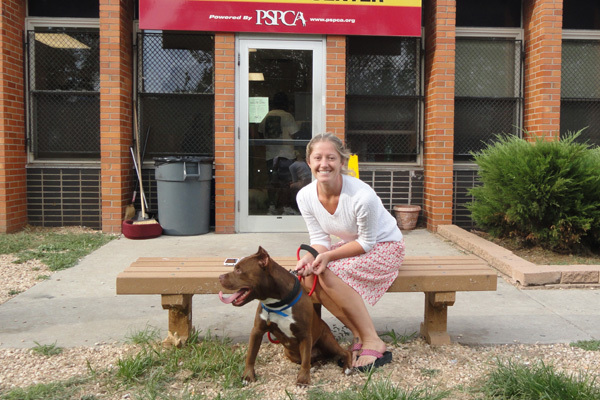 I was at the Philadelphia animal control shelter in September 2010 and met a cropped-eared brown pit bull who reminded me of my own dog, Sarge. 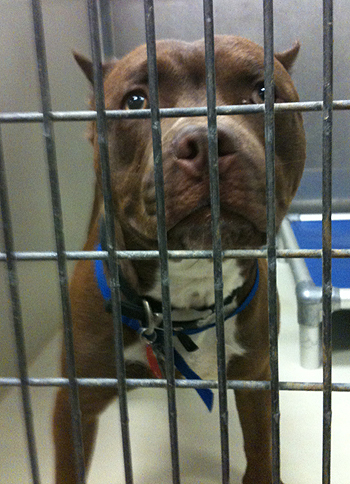 But really, I “knew” my stuff: This pit bull probably came from a “bad situation.” He probably wasn’t socialized. He probably was abused and abandoned. He probably could not be a good pet. He could. We adopted him, and it worked. He knew how to sit, how to take treats gently, how to meet small kids in the neighborhood. And he even knew not to pee in the house (most of the time). So how could this dog be proof of Philadelphia’s “pit bull problem” that we had warned the media about? I can’t speak for every dog, even though every dog has his/her story to tell, and surely there are dogs who have been failed completely by their owners. But I can tell you the story of my dog, Junior. Why? See that photo? 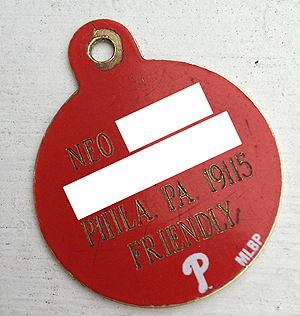 The one that says “Neo” and “friendly”? That was Junior’s tag. The shelter forgot to remove it, and lucky for me, it had his owner’s name, address and phone number. So I tracked him down, and he was happy and relieved that I did. Over the past year, we’ve become good friends. I shared Junior’s present, and he shared Junior’s past. “I was 27 years old when I got him. I got him for my son, but to keep me busy also. I tried to adopt from a shelter, but they wouldn’t give me a pit bull because I had a baby on the way and a 4-year-old living with me at the time. He was just the best dog anyone could ask for. He was so easy for me to train. He was introduced to the kids in the house and he never gave anyone a problem. He was always happy. I would take him to the park every day after dinner. That was our ritual and we would have a ball. He would catch the tennis ball and bring it back. He loved to run. Most of all, I think he liked snuggling on the couch with my son and me, just chilling. He also liked to go places. He was always sitting shotgun, no matter what. One thing is for sure: He was great with kids. Maybe it is because he has a big heart or because I trained him to be good with kids, but that dog has no hate in him. He is so loving. My son would chill with him all the time, and I had no worry. And my son was very young at that time. My family and neighbors all loved him. The kids around the neighborhood would come by all the time and ask if they could walk him. Giving him up was one of the hardest things I’ve had to do. When they say man’s best friend, yeah, he was. I was in tears for days about it. I even tried to get him back. But thankfully they said he had been adopted into a good home already. I was a single father who worked full time and was a nursing student and also had to care for my mother. While I was working or at school or helping my mom, there just wasn’t anyone there to let him out or keep him company. Friends and family all took different shifts to help. It worked for a while, but at the end of the day, it just wasn’t fair for him. I found out he got adopted when I called the shelter trying to get him back because I missed him so much. The shelter wouldn’t give me any info about his adopters, but I did leave his original name tag on which read, ‘Neo – Friendly,’ and my address. The wonderful people who adopted him were kind enough to find me on Facebook. It put my soul at ease. It has been awesome being able to feel like I know what he’s up to. I’m not going to lie, when I see pictures of him, I wish he was right here next to me. But he could not have been placed in a better home. WOW, can barely type tears are falling. This a story all to familiar. Animals lovers sometimes I feel don’t understand situations. Life happens and it catches us off guard at times. This happened to me and my family when we took in our “new” foster Chanel. Her owner was referred us and after hours of conversations and thinking it over and over the decision was made to get her. We didn’t want her to be another statistic. It has it’s ups and downs overall we wouldn’t change it. Thank you for sharing this provides confirmation we did the right thing! Wow! That was very touching. We have three rescue dogs and I wish sometimes that they could tell me their stories. Other times, I’m thankful they can’t because I don’t think I could bear what they would tell me. I’m so happy for the man that loved him enough to give him up and to the family that loves him now. This brought tears to my eyes. We’ve got four rescues and out of the four I wish I knew more more about our foster failure’s story. We live next to a city park and I have to wonder about her past. She has had the oddest reactions to some people pulling up to play in the park. Normally she just looks and barks, this one time she just about turned herself inside out over this woman and her two kids getting out of a mini-van. Crying, whimpering and just seemed to be beside herself, it was really odd reaction for her. She was found as a stray, hw positive and running out of time at the small shelter after being there 2 months. She’s a wonderful dog and I know she loves us, but I have to wonder about her family before we got her. @laurapmooney It’s completely natural to want to know our dogs’ pasts, but sometimes a dog can be incredibly skittish about something that wasn’t really a traumatic experience. This article just opens up the possibility that many shelter dogs didn’t have a horrible past. Good for you for rescuing your girl, we are sure she is extremely happy and loved. I’m so glad Junior got a new, wonderful home! Shouldn’t that have been taken into consideration BEFORE getting a dog?This story makes me very happy for the lucky dog and his new forever home, but I don’t think it’s “ok” or “normal” for someone with a busy lifestyle to get a high energy breed of dog and then dump him when they finally realize they don’t have the time. It happens EVERY DAY. This article makes it seem like the whole situation was totally acceptable and the original owner was a saint. It’s obvious the original owner loved the dog, sure, but he should have never gotten him if he didn’t have the time to care for him properly. The dog is extremely lucky to have been adopted and not put down, like the vast majority of pit bull type dogs in shelters. @unconventionallove We totally understand where you’re coming from. So many of us couldn’t even conceive of surrendering our dogs to a shelter, but sometimes situations change that are completely unexpected and unplanned for. And just because we wouldn’t do it, doesn’t mean we should condemn someone who did, especially since he did call the shelter to take him back, but he was already adopted by Kim. 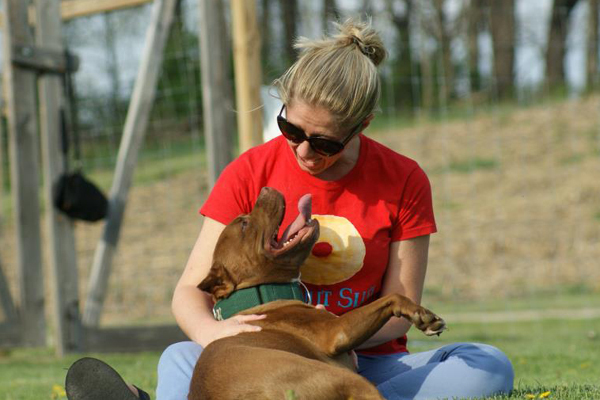 We believe the true point of this story is that not all pit bulls come from an abused past. We do thank you for your comments. I’m sure you are not alone in your feelings. @hyprgrl79 @unconventionallove you make some very good points about what people should consider when adopting a pet. however, the point of this article was about the past of a shelter dog, and not to assume the worst when it comes to pit bulls, because most of the time we don’t know their past. @hyprgrl79 This is Kim, I’m the person who wrote this story. I understand and agree about the importance of responsible pet ownership and making preparations. But I hope you’ll open your heart to the possibility that this man’s life changed completely, after he got the dog. None of the changes were in his control. And while it’s not my place to disclose the details of his situation, I can assure you that he made a series of extremely compassionate choices. I hope that you’ll find a way to extend the love you have for animals to the people who love them, too. If you knew this man, you’d be amazed by the great lengths he went to for his dog and for his family. @unconventionallove This is Kim, I’m the person who wrote this story. Thanks for being happy that Junior got a new home 🙂 I know you have compassion in your heart or you wouldn’t have rejoiced in that. I don’t feel the need to defend his owner’s actions, but since I know this man personally, I can tell you that your assumptions are not correct. His life circumstances changed after he got a dog. I hope you will extend the compassion you feel for dogs to humans as well. I also ask that you not label my dog Junior as a “high energy breed” without ever having met him. Junior is one of 6 dogs in our house, and each of them has their own personality. I would not describe Junior as “high energy.” So I don’t think it’s fair of you to label as such and then blame his original owner for that. @KimWolf I understand that his circumstances changed after getting the dog. That is usually the case. People need to learn that getting a pet means for life, and we all know life doesn’t always go smoothly. They are our responsibility when we choose to take their life into our hands.I understand the point of the article was to point out that not all shelter dogs have issues or abusive pasts. I just hope that you can understand that perhaps a message about responsible pet ownership resonates louder with those of us whom compare giving our dog up with giving our kid up. I’m facing some challenging life situations myself, but giving my pibble up is not even a thought.I said “high energy breed” because pit bull type dogs are generally considered high energy breeds, with lots of drive to please and plenty of brains to keep busy, as I’m sure you know. Of course there will always be exceptions to the rule, like Junior it sounds like, but pit bull type dogs are still generally high energy breeds, yes. Sorry, but this story IS about why dogs with irresponsible owners end up in shelters. 1) There is no mention of the owner reaching out to rescue groups in an attempt to rehome the dog. 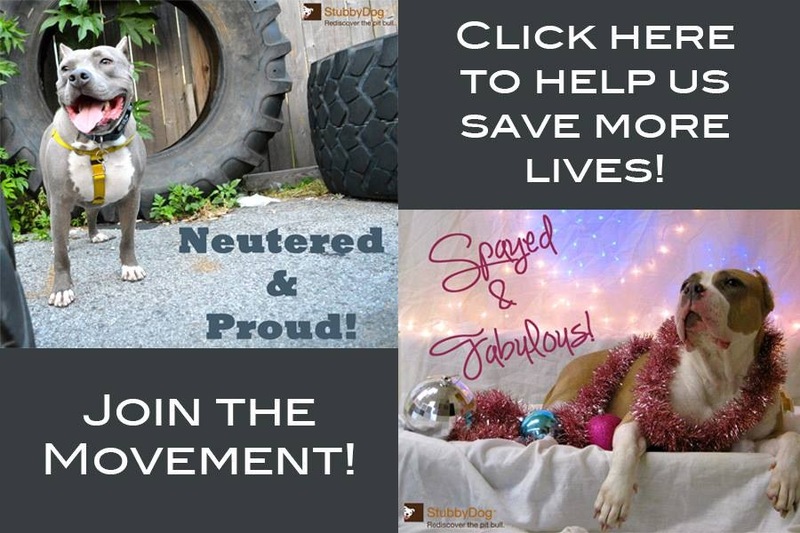 While many rescues will not accept owner surrender dogs, almost any rescue will help with cross posting the dog for web exposure and may allow you to bring your dog to their adoption events. Yes, this does mean you’ll need to hold onto the dog during this process but regardless of how little time to have for the dog I guarantee you have more time to give him than he would get sitting in a kennel run at the shelter. 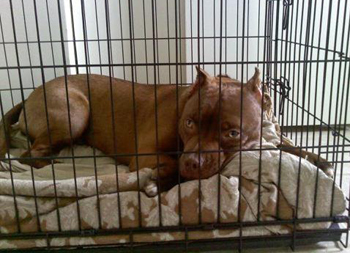 2) There is no mention of the owner putting any effort into rehoming the dog on his own. There are a wide variety of free listing services where the dog could have been listed so that a potential adopter could find him. Again, you do have to be willing to hold onto the dog while waiting but if you truly cared about the dog that shouldn’t be a problem. 3) And what if none of the above works and you are truly out of time? Personally I would rather see an owner have a dog euthanized that drop it off at a shelter where it MIGHT get a home but more likely will live a few VERY stressful days, weeks, months (depending on how tight kennel space is) to be euthanized by strangers who don’t know him and who he does not know. The fact that this former owner is being portrayed as a sympathetic figure is nauseating. Not because “life happened” and he had to give up his dog (although I’m betting “life happening” wouldn’t have made him give up his children or his wife) but because he apparently loved this dog so much that he couldn’t be bothered to put the slightest effort into working through the rehoming process. Nope, much easier to drop the dog off at a shelter and HOPE it all works out for the best. Another story about irresponsible owners filling our shelters… yep, it sure is. @Pretty Pitty This is Kim, I’m the person who wrote this article. I have to say, you have me in tears with your comments. I’m heartbroken that someone who has so much love for a dog could have so little compassion for a human being. You’ve made so many assumptions about a man you’ve never even met, based on a few details in a blog post. It’s not my place to disclose all the facts surrounding this man’s life; I just never expected some stranger online would be so cruel as to assume he or she could fill in the gaps. But what has me wiping tears off my face is that you’ve wished my dog were dead. You said it would been have better if my dog were killed than have spent a few days in the shelter. That hurts, and I’m at a loss for words.